I have been in Florida over the past four days, doing a bunch of things that loosely relate to peptide science. In fact, Orlando is where the American Peptide Society Meeting will be held in 2015. I found Miami to be particularly hot, and I suspect that Orlando will be even more so when our conference is held there in June 2015. But at least we will have a first class program for all of you peptide aficionados! When I got home and sat in front of my computer, the first thing I noticed was a very cool JACS paper by Professor Shu-Li Yu. The authors describe a palladium system that allows for highly regioselective allylation of substituted pyrroles at the C-2 position. While the regioselectivity is largely driven by the relative steric congestion at the more likely allylation site (the NH), the overall dearomatization of the pyrrole core deserves attention and is very impressive. The products of this transformation are chiral aza-dienes that will almost certainly generate attention in the synthesis community. Noting unusual selectivity is often a sure recipe for a productive research project, and Yu’s paper is no exception. The best thing is that complexity clearly increases in this reaction, which always pleases one’s eye (and is not always what we see in the literature these days). β-Lactams have long been the antibiotics of choice in the fight against S. aureus infections, but resistance to these molecules has emerged, causing alarm bells. MRSA, or methicillin-resistant staphylococcus, has been a growing concern for a long time due to the so-called PBPs (Penicillin-Binding Proteins). β-Lactams are known to irreversibly acylate the active-site serine of PBPs, resulting in bacterial death. In contrast, PBP2a is refractory to inhibition by essentially all commercially available β-lactams. Below you see a generalized β-lactam structure and its PBP2 nemesis. There have been many ways to approach the problem of creating new antibiotics, particularly non-β-lactam types (to circumvent resistance). Inevitably, these methods call for screening some large collections of molecules. I was intrigued by a paper in JACS published by Chang and co-workers from the University of Notre Dame. 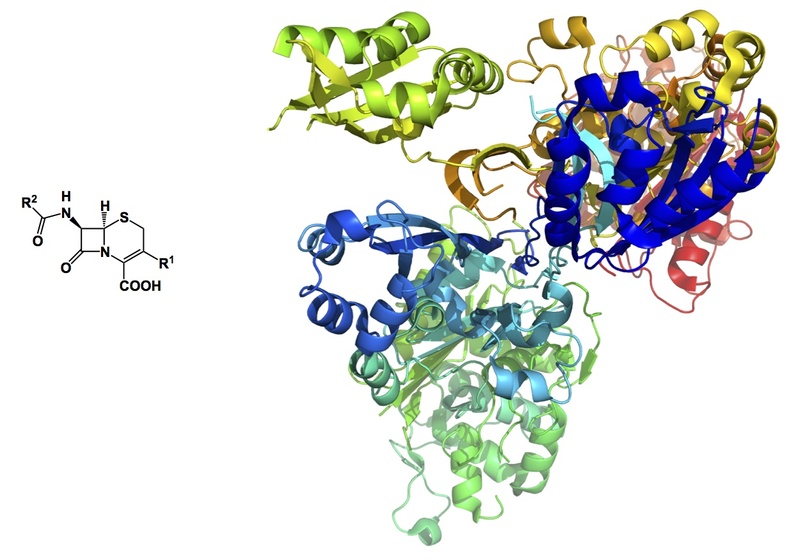 Looking for potential inhibitors, the authors screened 1.2 million compounds from the ZINC database against the X-ray structure of PBP2a of MRSA. The ZINC database was created by the Shoichet lab at the UCSF (Brian is now at the University of Toronto, and is also a member of the SAB of Encycle Therapeutics, a company I started in 2012). The complexes obtained using this method were scored using DOCK, Gold, FlexX, and ChemScore. Subsequently, 29 molecules were synthesized and/or purchased. The lead compound shown below was generated using a comparatively small-scale synthetic campaign, which is the main attractive feature here. This substituted oxadiazole is an exciting entity that offers a new avenue for exploring non-β-lactam inhibitors of PBPs. What is the main lesson here, you might ask? I think it is a clear and demonstrable promise of addressing important problems using modern docking algorithms. Papers such as this underscore the power of screening virtual collections. Here’s a fairly nasty question from the cumulative exam I gave earlier this month. It really got the graduate students confused, but that’s ok – it is indeed a bizarre reaction. I learned about it several years ago, when I visited Professor Chiba’s lab in Japan. What you see is a process that amounts to radical cation-driven metathesis reaction. This is a good example of a process that goes by an unusual mechanism and accomplishes something that is well familiar to many. There is no need to compare the scope of this process to what we are accustomed to seeing in ruthenium catalyzed chemistry. This is not the point. We should still be thrilled when we get to see nifty tricks emerge in less conventional areas that are relatively underpopulated (I refer to electrosynthesis). This is the quintessential “outside the box” sort of stuff! About a year and a half ago, I was asked to put together a special issue of Chemical Reviews dedicated to small ring heterocycles. This project has taken a lot of organizational effort, but it has been rewarding to assemble a team of researchers who have pushed back the frontiers of this area over the past 10-15 years. I am going to post more information pertaining to this special issue as the project nears completion, so stay tuned. I just want to mention one name from this compilation: Professor Daniel Romo of Texas A & M University. The reason I want to talk about some of his classic work tonight is because it serves as an example of going after molecules which, on paper, have little reason to exist, yet are surprisingly stable even to column chromatography. Below you see Romo’s spiroepoxy-beta-lactones. Their synthesis is deceptively simple: add DMDO to a diketene. That’s it. The resulting molecules look wild, but many of them are isolable and stable to column chromatography. In these structures, you might imagine some really interesting manifestations of the anomeric effect. Romo talks about the crystal structure of a representative member of this series in his JACS report and discusses stereoelectronics there. There are also some nice synthetic applications of spiroepoxy-beta-lactones demonstrated in this manuscript. One disadvantage of these molecules is the symmetry of the ketene dimer precursors. Oh well, life can’t be perfect (my lab knows it all too well when we deal with an occasional reaction that does not fully destroy the aziridine aldehyde dimer). The correct choice of a ligand in transition metal catalysis is often the difference maker. Besides the steric and electronic parameters inherent to a given ligand structure, an interesting facet of structure/function relationship lies in the chemical modification of the ligand core during the reaction. This feature relates to a general question that is seldom addressed: how do you know that what you think is the ligand structure is actually responsible for the reaction under scrutiny? There are many examples where one can propose in situ modifications of the ligand core, yet one does not always monitor what happens to his/her catalyst during and after the reaction. I am sure there are many additional insights that might be obtained from such studies. There are, in fact, good examples showing the significance of in situ ligand modification. The one I want to cover today comes courtesy of Professor Pat Walsh at Penn. 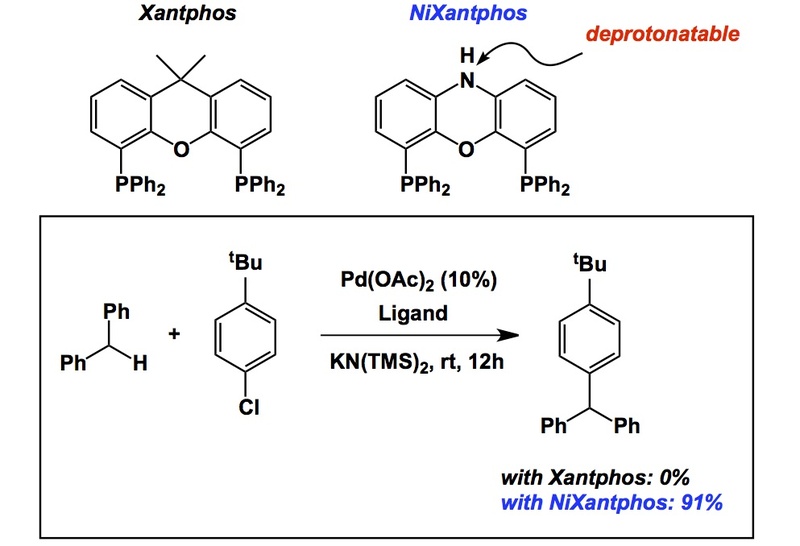 In his JACS report, Pat and his students describe the NiXantphos ligand that is deprotonated during the reaction. As a result, the authors observe facile oxidative addition of aryl chlorides to palladium coordinated to a bidantate ligand, which is unprecedented. Take a look below – there is no reaction with Xantphos, but 91% is obtained with NiXantphos. This is a striking example of how a “deprotonatable” ligand site plays the decisive role. I was looking at my Papers3 collection today (those of you who have a Mac and do not have this software – get it right now, while those of you who have a PC – well, I am sorry…) for some non-coordinating anion chemistry. I came across an old paper by my good friend Sergey Kozmin of the University of Chicago, who explored the powerful properties of HNTF2 acid in catalysis. The reaction you see below is one of the examples in the fascinating segment of synthesis where triflamide anion plays its pivotal role. Incidentally, the chloride substituent in the product does come from dichloromethane, so check out the mechanism. 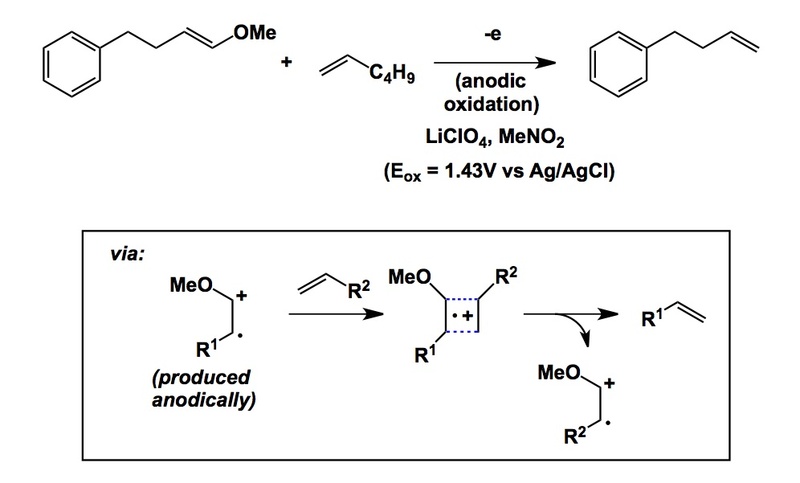 Lewis acid catalysis is another area where triflamide anions have been put to good use. The link below describes the work of Niggemann and co-workers, who have developed a very unusual set of conditions that call for the use of calcium triflamide in conjunction with tetrabutylammonium hexafluorophosphate (this combo is now available from Sigma-Aldrich, so I want to check it out in our own work). The central role of the non-coordinating triflamide anion is on display in this reaction as well. What else might we think about? Perhaps electrophilic fluorinating reagents of the Tf2NF class come to mind, plus some other applications? The bottom line is that non-coordinating anions offer a rich area for exploration because they do not meddle in polar reactions that occur in their vicinity. Today I will talk about microcystin and its mode of action. This molecule is one of my all-time favourites because of its unique reactivity. Below you can see a view I created using 1FJM entry from the Protein Databank. This picture shows the electrophilic warhead of microcystin and identifies the surface-exposed nucleophilic Cys-273 residue of PP1 phosphatase. This cysteine irreversibly interacts with the electrophilic acrylamide portion of microcystin. My lab has been after some complex peptide macrocycles equipped with electrophilic aziridine residues. 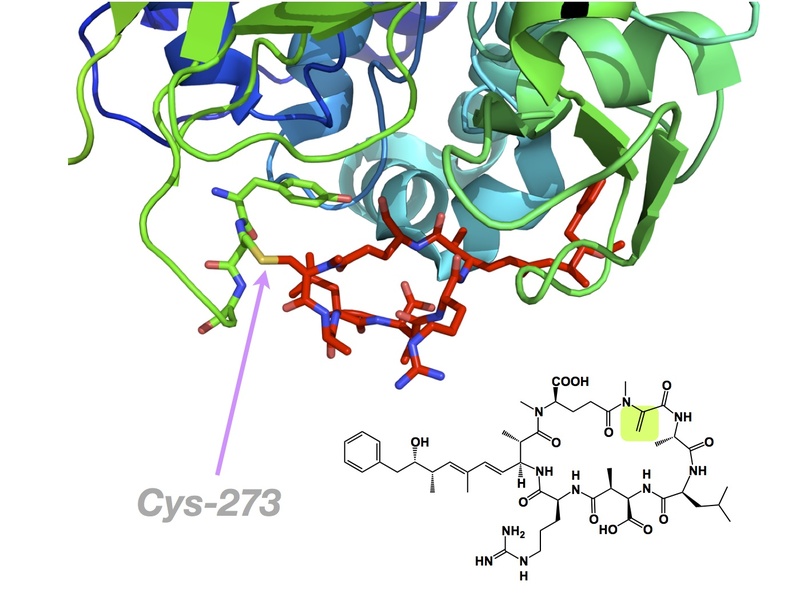 We do not yet have any significant stories to tell in our efforts to covalently inhibit cysteine-bearing protein targets, but we do have the methodological makings of an interesting approach in collaboration with Ben Cravatt of Scripps. So far our molecules seem to be inert against cysteines, which is somewhat of a surprise, yet gives us confidence that we might eventually find something really selective. Back to microcystin: this nanomolar phosphatase inhibitor is a nasty beast that was isolated from cyanobacteria. The corresponding blue-green algae contaminate drinking water and have long been known to be the cause of animal deaths.